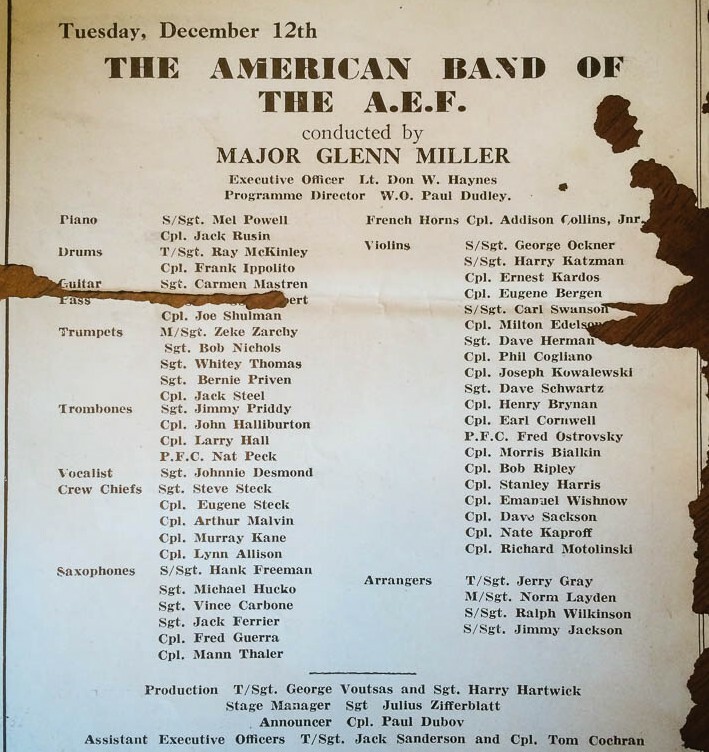 In the summer of 1944, Glenn Miller and his Army Air Force band travelled to England to play over 800 performances for service men involved in the war effort. After the U.K. tour, they were scheduled to head to France to begin a six week tour of American air force bases and field hospitals. That tour never happened. On December 15th, three days after his last performance, Glenn Miller’s aircraft disappeared in bad weather over the English Channel. He was not missed until his band landed in Orly on December 18th. Glenn Miller’s last performance before his dissapearance was at the Queensbury All-Services Club in London on December 12th, 1944, and the man from the suitcase was there. The Queensbury All Services Club was located in Soho, London. The building is now known as the Prince Edward Theater, which was it’s original name at the beginning of this venue’s interesting history. The Prince Edward was originally opened in 1930. By 1936, the venue had changed hands and was known as the London Casino, functioning as a cabaret restaurant. The new format was a hit, and the London Casino became the hot place to take in a revue, such as Foiles Parisiennes which opened in April of 1936. Between 7 September 1940 and 21 May 1941, London was attacked by the German Luftwaffe 71 times during a period know as The Blitz. One year into the war, London was bombed by the Luftwaffe for 57 consecutive nights. More than one million London houses were destroyed or damaged and more than 40,000 civilians were killed, almost half of them in London. The Blitz put a temporary stop to the good times at the London Casino. The theater was dark until it reopened in 1942 as the Queensbury All-Services Club. After the war, the Prince Edward was converted to a large screen Cinerama (The London Cinarama Theater, 1956-1974) and finally restored to it’s theatrical roots and original name in 1978. It’s continues to operate today. The Queensbury All-Services Club invited artists such as Vera Lynn, Petula Clark, Bing Crosby and Glenn Miller and produced over 2500 live broadcasts to servicemen and women across the globe. In 1942, at the peak of his career, Glenn Miller volunteered to join the U.S. Army. At age 38, he implored the Army to make use of his talents and allow him to form a modern military band. His proposal was accepted and he formed a 50-piece Army Air Force band, which became immensely popular thanks to a weekly global radio broadcast. In addition to performing over 800 concerts in the U.K., Miller and his band visited the Abbey Road recording studio where they recorded propaganda broadcasts for the Office of War Information. Glenn Miller was very popular in Germany and the recordings featured songs sung in German, as well as Miller himself speaking about the war effort auf Deutsch. Due to his global popularity, Miller’s involvement in the military was a huge morale booster to the troops on the ground and the lucky service men who were fortunate enough to see him conduct in person. Which brings us back to the suitcase. This program was one of three entertainment playbills that were in the suitcase. I had initially set this artifact aside after a quick scan. It wasn’t until later that I realized I had missed an important fact about the program for the week of December 11th, 1944. Popping on my Glenn Miller Best of the Big Bands vinyl for inspiration, I started researching Miller’s brief military career. Although I’ve always been a fan of his music (and be honest, who doesn’t start to swing when In The Mood comes on?) I somehow wasn’t familiar with his mysterious disappearance. The circumstances are as follows: On December 15, 1944, Maj. Glenn Miller left Bedford, UK from a military airfield in single-engine Norseman aircraft. He and his band were due to start a 6 week engagement for the Allied troops stationed in France. The full band flew separately, landing in Orly on December 18th where they discovered that Miller had not arrived as scheduled. From that point on, the conspiracy theories started to fly. There are three main theories about Miller’s disappearance, each now generally thought to have been de-bunked, presented below in order from most logical to the absurd. A Royal Air Force bombing run, abandoned mid-flight due to bad weather, jettisoned their weapons package prior to landing (a full payload of bombs makes landing very risky due to extra weight and, you know, explosives). They happened to dump all those bombs over a designated area of the English Channel where a certain single-engine aircraft was also flying. This theory was suggested by Fred Shaw, a navigator with the 149th Squadron who participated in the abandoned bombing run. Shaw remembers looking out the window and identified a Norseman flying below them squad. The plane went into a tailspin as the bombs dropped. After hearing the news about Miller’s disappearance, Shaw checked his log book and saw that both incidents occurred on the same night, although the timeline didn’t quite align. Suffered a fatal heart attack in Paris, while in the arms of a prostitute. This theory is widely thought to be propaganda, slipped into the ears of the German press by Nazi intelligent officers. Miller was an Allied spy involved in a secret mission, and under Eisenhower’s direct instruction was required to leave for France before his band members and rendezvous with intelligence officers to disrupt Hitler’s war plans. This theory was proposed by Hunton Downs, a Pulitzer Prize nominee for his reporting during the Vietnam War and recipient of the Edward R. Murrow Citation for “Excellence in Reporting”, for his daily broadcasts from the Berlin Wall as News Editor of Voice of America. Downs published a book in 2009 that detailed his research: The Glenn Miller Conspiracy: The Never-Before-Told Story of His Life — and Death. All these theories and more are detailed in an episode of History Detectives, a PBS show that “asks probing questions behind a single iconic mystery from America’s past”. They produced an episode about the mystery: The Disappearance of Glenn Miller. The History Detectives episode includes Dennis Spragg’s now widely accepted theory about Miller’s untimely end: Miller attempted the journey in a class of aircraft which had been recalled due to defective carburetor heaters. They had a tendency to freeze up and stop working. You can read more about Spragg’s research here. “At 10 o’clock on the morning of the 12th, his musicians traveled from Bedford, England to London, for their appearance at the Queensbury All-Services Club. There, Miller rehearsed them and that afternoon they recorded a broadcast (which would not air until Friday the 15th). The band then did a half-hour concert for the 2500 people in attendance in-person at the Queensbury All-Services Club. It was the final time the musicians would perform under Miller’s direction, and the very last tune they played that evening was “Tuxedo Junction,” one of his most famous hits. Did our Man from the Suitcase attend Glenn Miller’s final broadcast on December 12th, 1944? We can’t know for sure, but he kept the Queensbury All-Services Club program alongside two other playbills from his trip to London. Maybe he attended one of the other programs that week and chose to keep the program as a memento, unaware that he coincidently saved an incredible artifact from the last performance of one of America’s most beloved band leaders. Either way, it’s a remarkable find and just one of the many surprising artifacts John Paul Jones left behind. Have you ever attended a historical performance? Let us know in the comments! Richards, Denis (1974) . 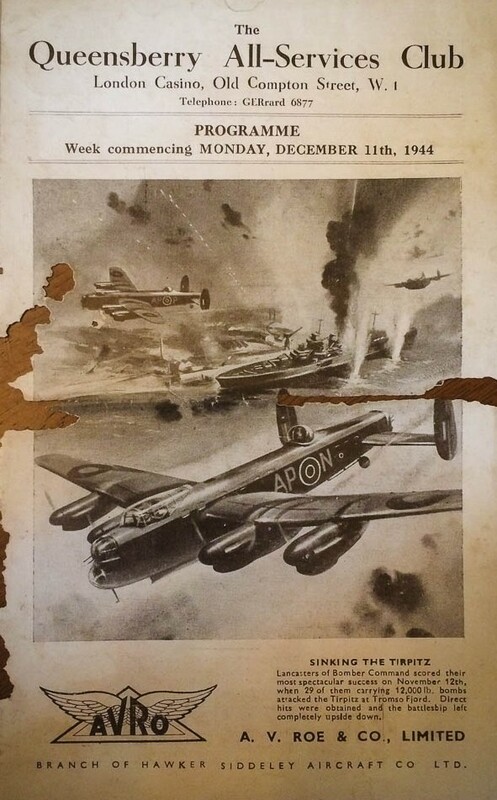 Royal Air Force 1939–1945: The Fight At Odds p. 217. Bruce Robinson (30 March 2011). “The Blitz”. BBC. Retrieved 27 March 2012. My father, Phil Sparling, was a member of the RCAF (Royal Canadian Air force) Streamliners, a wartime dance/stage band that played on several occasions at the Queensbury All-Services Club. He often told me that the band played stand-in for Miller’s band “a few nights” before his fateful flight on Decdember 15th. I’m trying to determine if it was at the December 12th show at the Queensbury Club..
FYI…I’m meeting archivist Rosy Runciman at the Prince Edward Theatre on on Tuesday April 12th for a tour…..just in case anyone has any information to share with me. Andy, that’s a fascinating story! Exciting that you get to tour the Prince Edward. The program I have only lists the names of the A.E.F. band. Christopher Popa, of Big Band Library might be able to help you find out if there was a stand in band. Good luck and enjoy your tour! I have a concert programme of the queensberry all services club dated September 1944 and signed by glenn miller and sam Donahue who was the united states navy band leader.which I bought at christies in London in 1986. Wow! That’s an incredible artifact! Were you aware of the significance of the date when you purchased it?